Man's eternal quest to fit every device possible onto his wrist continues with the Triple Watch Cellphone. It's currently just a prototype, but its designer, Manon Maneenawa probably wouldn't mind it going into production. 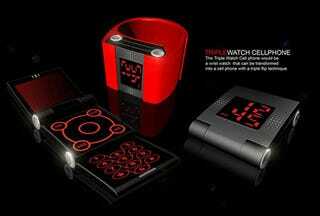 The Triple Watch Cellphone looks like just a watch to the untrained eye, but as its name alludes to, it's also a cellphone. Note that you don't have to unfold it to use it as a cellphone: with the push of a button you can talk to your amigos till their ears bleed. If you're so inclined, you can combine it with a Bluetooth headset to get the desired "I'm-talking-but-there's-no-phone-in-my-hand-I-must-be-crazy" look. Of course, you could just unfold it and use it like a normal cellphone, but that detracts from its artistic vision.